Hamilton, NJ, January 21, 2019 –– With the coldest temperatures of the season in the forecast for today and tomorrow New Jersey homeowners could find themselves dealing with damage caused by frozen or burst pipes. With periods of brutally cold weather, pipes are at risk of freezing due to sudden temperature drops, poor insulation or incorrect thermostat settings. Temperature fluctuations this time of year in New Jersey– the thawing from warmer temperatures, along with the refreezing at night – could continue to contribute to the problem, according to AAA Insurance experts. Make sure everyone in your family knows where the water shut-off valve is and how it works. Insulate pipes in your home's crawl spaces and attic, even if you live in an area where freezing temperatures are unlikely. Seal gaps around pipes that allow cold air inside. You also should look for air leaks around electrical wiring, clothes dryer vents and pipes. Use caulk or insulation to keep the cold out. If a freeze is expected, consider allowing warm water to drip slightly overnight, preferably from a faucet on an outside wall. Even a slight trickle may keep your pipes from freezing. When there is the possibility of a freeze, don’t turn down the thermostat at bedtime. Instead, maintain the same setting day and night. 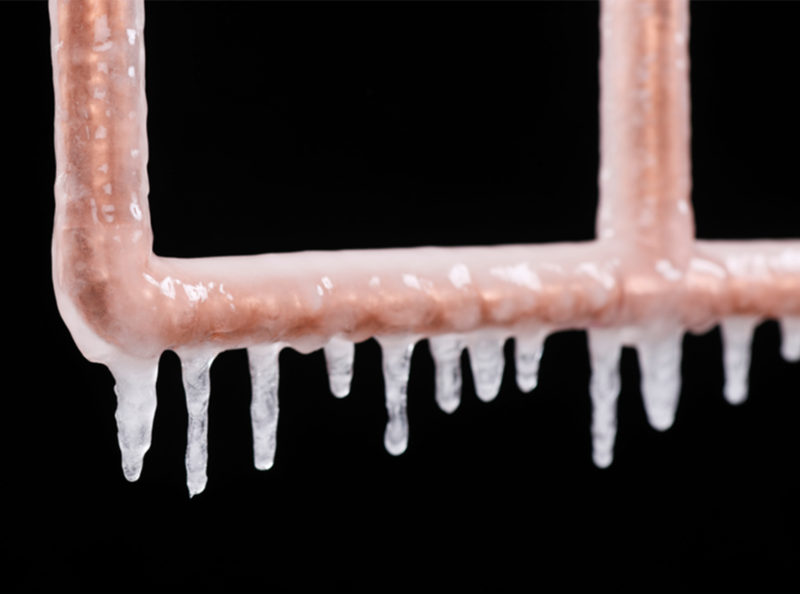 Drops in temperature, which are more common overnight, could freeze your pipes. If you’re going on vacation or leaving your home for an extended period of time, consider maintaining minimal heat to prevent freezing. AAA Travel agents report that this is a busy time for travelers looking for good deals or trips to warmer places. If you turn on your faucets and nothing comes out, your pipes are likely frozen. Don’t wait for them to burst. Take measures to thaw them immediately, or call a plumber for assistance. Mop up spills. You do not want the water to do more damage than it already has. Call your insurance company claims department as soon as you can. An insurance adjuster does not need to see the spill before you take action. However, the adjuster will want to inspect any damaged items. Make temporary repairs and take other steps to protect your property from further damage. Remove any carpet or furniture that can be further damaged from seepage. Make a list of the damaged articles and take photos. Save the receipts for what you spend—including additional living expenses if you must leave your home until repairs are completed—and submit them to your insurance company for reimbursement. Standard homeowners policies will cover most of the kinds of damage that result from a freeze. For example, if house pipes freeze and burst or if ice forms in gutters and causes water to back up under roof shingles and seep into the house. You would also be covered if the weight of snow or ice damages your house. If your home sustains water damage, it is important to make sure that it is properly dried and repaired to prevent any potential problem with mold. Remember, mold cannot survive without moisture. Check with your agent or insurance company to be sure of what your policy covers. To find out more about homeowners or renters insurance, contact a local AAA Insurance agent at 866-AAA-4YOU or visit AAA.com/Insurance.